September 10, 2012 by John P.
Sous Vide cooking is a method that involves vacuum packing food into bags and then dropping them in a tightly temperature-controlled water oven to bring the food up to the exact temperature of doneness. In our testing, we used steak and cooked it to a medium-rare temperature, compared to a control batch cooked exclusively on the grill. Of course, it’s possible to replicate this style of cooking without any fancy machinery. Its just going to take a lot more time and energy on your part. Here’s the stove top method of cooking sous vide using nothing but a pot, a thermometer, a ziplock, and a straw! Maybe you want to try this once before dropping the coin on a machine? Though be aware that you are going to have to babysit that pot and continually adjust it for temperature control. Doesn’t sound like much fun to me. 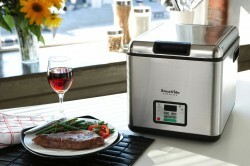 The SousVide Supreme Water Oven is available on Amazon in a variety of sizes and packages. The smaller 8.7 liter version, SVD–00101, runs $329 and should be big enough for most kitchens. The medium sized Sous Vide Surpeme, SVS-10LS, is a 10 litre unit for $429. The large SousVide Supreme 11.2 Litre Sous Vide Water Oven Package, which is what I tested, goes for $499 and includes a vacuum packing machine. While we can’t yet report on the long term reliability of the machine, in the short time we’ve had it the Sous Vide Supreme has proven to deliver exactly what it promises – namely, perfectly cooked food every time. 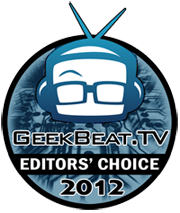 We’re awarding the Sous Vide Supreme a Geek Beat Editor’s Choice award because its the simplest, most repeatable, and most reliable cooking method we’ve ever come across. The only downside to using a water oven seems to be the additional time it takes to cook certain foods. But then again, it’s still faster than using a crockpot or smoker. Got a good Sous Vide recipe to share? Drop it (or a link) in the comments below so we can all enjoy it with you! I have been sous vide cooking for about 5 years now. The advantage is that you can take a $3.50 a pound Eye of Round steak and make it as tender and taste better than a $13 a pound filet of tenderloin. The really expensive cuts of beef—NY strip, rib eye, Porterhouse, T-bone, Filet (tenderloin)—have been chosen for their extreme tenderness, not particularly for their flavor. Otherwise more flavorful cuts like hanger, blade, or flatiron steak are much more difficult to cook correctly, and you’re left with a tough, stringy, chewy mess. But cooked properly, they can be every bit as tender as the more expensive cuts, and with more flavor. In the bag put butter, garlic, thyme and salt and pepper. Cook them for 12 to 24 hours in the sous vide and then give them a couple of minutes on each side on the grill or a grill pan and you will a cheap steak that cannot be beat. Got so excited when I saw HollyPoz on the Geekbeat, I clapped and hollered and had to rewind – cuz I hadn’t heard a thing while I was so busy making a ruckus! Haha! This would allow someone like me, who is completely useless with the grill (save for hotdogs! ha!) to actually “grill” a steak or pork chop or whatever. Hmm…what about hamburgers? I destroy those on the grill, too. Can the Sous Vide do burgers? My takeaway from this is that if you have grilling in mind, there’s not a lot to gain with a SousVide oven. I’m sure there is more to it than just grilling steaks, but as a first look at this, I’m not at all convinced that this would be worth the steep price tag. I’m assuming your Editors Choice award is based on more than this experiment, since the outcome wasn’t all that impressive, and I’ll be interested to see more of this oven in action and find out if the results vary with other recipes and foods. You’re right, the award was based on a lot more than that one test. The general construction of the machine, its performance, and the quality of the food that came out of it were all taken into consideration – as was its relative uniqueness in the market. What I think we should have done in retrospect is have someone who didn’t know how to grill compete against me head to head. It seems that something was lost at the end when we revealed that it tasted similar to my essentially expert grilling technique. The big impact of this machine is really that it would allow someone with absolutely zero skill to produce a product that is as good or better than someone with a great deal of both practice and attention. Having said all that, I will be producing some follow up videos to demonstrate how it does with other foods and in different conditions. Interesting treatment of the SousVide machine, but this opens up many more questions. We need a thorough look at the vacuum sealing options. I have the same model FoodSaver unit that you use I’m the video, and it’s on the verge of inhaling it’s last breath. Now I need to explore other options. Now, back to SousVide cookery, I don’t think I need it for a nice steak, but a more delicate protein, like various fish, may benefit greatly from this method. Anyway, thanks for producing the great video! Thanks for the suggestion Joe. I’ll have the team reach out to the various manufacturers and see if we can do a Vacuum Sealer shootout. Also, I’m going to do some follow ups on the SousVide with other foods. I’ll definitely try some fish, and also some veggies and perhaps a few other fairly exotic things. Stay tuned! Chief Gordon Ramsay would throw you out of the kitchen, Ha ha! Your conclusion is that the grilled steaks look better and cook a lot faster, but people should spend the $400-$500 if they want consistency and the ability to cook easily. You can get a lot of cooking lessons for $400-$500. My comments are only in response to your comments, obviously you only cooked steaks and you knew how to cook them on a grill. I would be interested to hear other peoples views on this. You’re right Paul. So far, I have only done steaks. But the reason I chose them was that steaks are one of the hardest things to cook – well. Most people will under or over-cook steak, and feel that they get a truly random result. Hence the fact steaks are often so dried out and over-done. What I learned from the steak experiment was that you can literally leave the steak in the bags for hours without over cooking them. Then a quick turn on the grill to add some color and texture, and voila! Anyone could make a steak as good as me, even though I’ve got decades of experience. By the way, you could even under-cook the steaks a little and then leave them on the grill longer to truly mimic the “totally cooked on the grill” look. But I don’t think anyone needs bother. So, I think its less about achieving cooking skills and more about achieving consistency. Even great chefs can get distracted. But the Sous Vide method takes the worry out of over cooking them. Now all we need to worry about is trying to maximize the flavor! So I’ll be experimenting with much more complex recipes and I’ll share them here so everyone can see how it goes.